Iwaruna.com » What’s wrong with prunes in sticky caramel pudding? Nuffingk. Nuffingk at all. Nor is adding five-spice powder. “What? What?” you ask. Yes, warm sticky pudding made with prunes and dates, especially if one runs out of dates but finds a nearly full bag of prunes, and especially with five-spice and ginger and cardamom — “Bwah! Madness!” you exclaim. Ah, but this pudding does turn out well, especially when, er, since I had an abundance of caramel sauce just begging to be used. I got the hankering for such a pudding when I saw the recipe for American Masala’s Sticky Toffee Cake at Zoë Bakes. The adding of Indian spices to this comforting pud, not to mention the easy blending of ingredients, caught my heart (er, stomach) and mind. 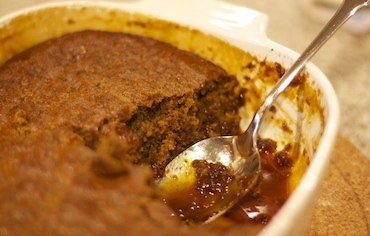 But I needed a recipe that gave weight measurements for flour (yes, obsessed I am, Young Skywalker), and found David Lebovitz’s Warm Sticky Toffee Pudding — in which the sticky goodness bubbles along with the baking pudding. 3/4 cup sugar; 3 tablespoons of this was vanilla sugar — otherwise, add 1 teaspoon vanilla extract. Grease a 9 inch square casserole dish. Pour in 1 cup of the caramel (or toffee) sauce so that it evenly coats the bottom of the dish. Pop dish in refrigerator for at least an hour or two, so that the sauce becomes firm. Combine the dates, prunes and water in a sauce pan, cover, and bring to a boil. Take sauce pan off the heat, stir in the baking soda, butter, salt, five-spice, cardamom and ginger powders, and if using, vanilla extract. Set aside to cool so the fruit-spice mixture isn’t too hot, about 100Fº to 120Fº degrees. In the meantime, sift the sugar (and vanilla sugar, if using instead of extract), flour and baking powder into a bowl using a fine strainer. When cool enough, use a hand blender to purée the fruit-spice mixture. Whisk in the eggs. Then fold in the sugar-flour mixture; a balloon whisk is great for this latter task, as it reduces the likelihood of overbeating the batter. Pour the batter on top of the chilled sauce, and pop unconvered into the oven for 35 to 50 minutes. It should be done when the batter pulls away from the casserole sides, and when a knife stuck in the middle of the sponge portion comes out clean. This was written by sairuh. Posted on Thursday, April 7, 2011, at 1:37 pm. Filed under Food. Tagged dessert, pudding, recipe. Bookmark the permalink. Follow comments here with the RSS feed. Post a comment or leave a trackback.